One thing I’m thankful for this year, besides watching the balding Matt Lauer and his lady friend sidekick host the Macy’s Thanksgiving day parade, are the addition to the floats. 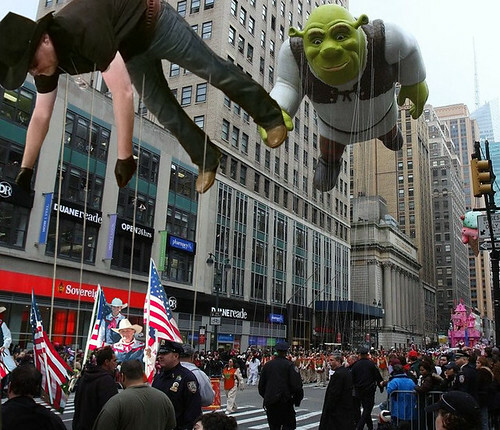 You see, each year we are supposed to be amazed and wowed at all the corporate mascots floating over New York City, as if they were angels watching over us. But this year is different, this year the good guys won. This year hope will once again rise over New York City and thru the television sets of millions across the world. In large part due to public demand, we have been accepted to tow a floaty that is 50 times the size of the real life Champ Nutella. I can say with absolute certainty, that kids the world over will look to the sky over New York City and see the greatest superhero since Alexander the Great made his debut in 356 BC. He’s not some drab mouse that stands for oppression and sweat shop produced products. A corporate shill if there ever was one. No sir, this year we celebrate justice, heroism, and over-sized gun belts. As you get ready to pray and give thanks by consuming sinful amounts of calories only to wake up in the wee hours of the night and go to your favorite retail store where you proceed to trample someone in order to save $15 on an electronic product that will sit on your shelf collecting dust in a matter weeks, take a moment and thank Champ this year for keeping the real meaning of Thanksgiving alive. Previous Article← Are You a Same Sider?